© Masahisa Fukase Archives. Courtesy of Michael Hoppen Gallery. Performing for the Camera examines the relationship between photography and performance, from the invention of photography in the 19th century to the selfie culture of today. Bringing together over 500 images spanning 150 years, the exhibition engages with the serious business of art and performance, as well as the humour and improvisation of posing for the camera. The exhibition begins by considering the documentation of important performance works such as Yves Klein’s Anthropometrie de l’epoque blue 1960, a live painting event using the bodies of naked women, as well as key 60s performances by Yayoi Kusama, Marta Minujín and Niki de Saint Phalle. Drawing on an extensive collection of images by Harry Shunk and János Kender, two of the most important photographers to have worked with performance, the exhibition features iconic images and many rarely seen studies, including those revealing how the photomontage of Yves Klein’s famous Leap into the Void 1960 was made. By charting how performers and photographers have also worked collaboratively, the exhibition examines live events that happened solely for the camera. Beginning with some of the earliest works in the exhibition, photographs from Nadar’s studio in 19th century Paris show the famous mime artist Charles Deburau acting out poses as the character ‘Pierrot’. Later works drawing on this same idea include Eikoh Hosoe’s Kamataichi, a collaboration with the choreographer and founder of the Butoh movement Tatsumi Hijikata. This seminal 1969 work is one of the first to have given equal authorial credit to the performing subject and the photographer. The photographic image went on to become an arena within which to act, distinct from the live stage of theatrical or artistic performance, in works by artists like Charles Ray, Carolee Schneemann and Erwin Wurm. These artists often perform for their own cameras, either physically as in Paul McCarthy’s Face Painting – Floor, White Line 1972 or more conceptually through ideas of self-image and fantasy as in the work of Boris Mikhailov. The construction of self-identity and posing is explored through iconic works by Claude Cahun, Man Ray and Cindy Sherman, as well as more recent projects like Samuel Fosso’s African Spirits 2008, in which the artist photographs himself in the guise of iconic figures like Martin Luther King Jr and Miles Davis. 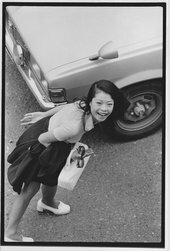 The exhibition looks at the innovative and performative approaches taken to self-portraiture by Lee Friedlander, Masahisa Fukase and Hannah Wilke. Identity and self-image were also important for artists like Jeff Koons and Andy Warhol in their own marketing and promotional photographs, and in more playful works like Mike Mandel’s Baseball Photographer Trading Cards 1974 in which photographers pose as ‘collectable’ baseball players. The world of social media is addressed in a key recent work staged on Instagram by Amalia Ulman. The exhibition shows not only that photography has always been performative, but that much performance art is inherently photographic. Performing for the Camera is curated by Simon Baker, Senior Curator, Tate Modern with Fiontán Moran, Assistant Curator, Tate Modern. The exhibition is accompanied by a catalogue from Tate Publishing and a programme of talks and events in the gallery. Hyundai Card is a leading premium credit card company based in Seoul, Korea. The company is a subsidiary of Hyundai Motor Group. It has been named the credit industry’s “Most Respected Company” and ‘Most Desired Employer’ by Korea’s largest management consultancy association. It was also ranked #1 in customer satisfaction for five years in a row by Korea’s National Customer Satisfaction Index. Hyundai Card is also more than just a finance company interested only in numbers; it is an enthusiastic promoter of design and art, finding ways to embrace them in every area. Whether it is building libraries on design, travel, and music for Hyundai Card members to enjoy, crafting concert experiences that are meticulous to the last detail, or designing credit cards as beautiful as they are functional, Hyundai Card’s most inventive endeavours all draw from the creative well that the arts provide. A tour with the exhibition curators which explores the relationship between performance practice and photography. The tour on 14 March will be led by Assistant Curator Fiontan Moran and the tour on 6 June will be led by Senior Curator Simon Baker. During an out of hours exhibition viewing, featured artist Erwin Wurm invites the audience to make a One Minute Sculpture. Using everyday domestic objects and found furniture, Erwin creates situations and instructions that allow the audience to become an artwork for sixty seconds.